Michael Franti is a very big man who has always dared to say very big things through his joyous and passionate music during an unusually diverse and highly impressive career. Yet for all the wide-ranging, yet consistent excellence of his body of work, what's most impressive about Michael Franti as a recording artist and live performer is his ability to inspire. Ultimately, the heartfelt music that Franti makes and his dedication to greater understanding on a global level, are not two aspects of his life, but very much one and the same. The Bay Area born Franti has been bringing our world exceptionally powerful, deeply felt music under a variety of names and in a wide range of genres for twenty years. From the intense punk rock of the Beatnigs, to the deeply political rap he made with the Disposable Heroes of Hiphoprisy to his joyful and meaningful modern soul music with Spearhead, and now as Michael Franti & Spearhead, this still young man has released an impressive series of recordings that have vividly reflected his status as a musical citizen of this world. Consider Franti's most recent musical masterpiece, All Rebel Rockers, an album featuring the legendary production team of Sly & Robbie that reinforces his place as a global force and a true musician of his time. 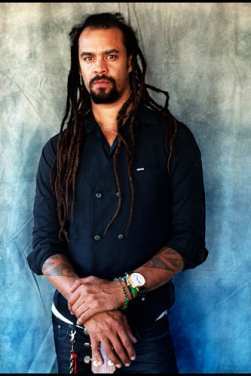 Recently, Franti's latest release entered the Billboard Top 200 Album Chart in the Top 40 and hit #4 on the Top Independent Album Chart, and further demonstrated that Franti remains very much at the height of his artistic powers. "As a musician and a man, I more than anything else want to be a unifier," Franti explains. "I want to bring people together through music and its unique power. And I hope that somehow that sense of unity extends beyond the music." To see Michael Franti play for people anywhere in the world is to realize that music is the driving force in his creative world. "Above almost any thing else on earth, I love songs," he explains. "I love songwriting myself, but in listening to the songs of others, I've learned that a great song is an incredibly powerful thing. I really believe that music can bring people together because I've seen it. To me, music is much more than the way I happen to make my living. It's the thread that's gone through my life and given it so much meaning. Franti's own performances today are marked by a genuine openheartedness, a commitment to communication and a greater sense of community. "The people who come to see us seem to love the experience of the party as well as the message and the music," he says. "Increasingly over my life, I have less interest in being part of the fighting between parties. I'm interested in bringing people together on the left and the right, to face the issues of the day. The problems from global warming to the economy that we face today are so clearly universal that we need to address them together."